What comes to mind when we think of Christmas Past? Memories of horse-drawn sleigh rides, boughs of holly and a Yuletide log, perhaps, and a far cry from the modern computer-programmed dazzling displays of Christmas lights. 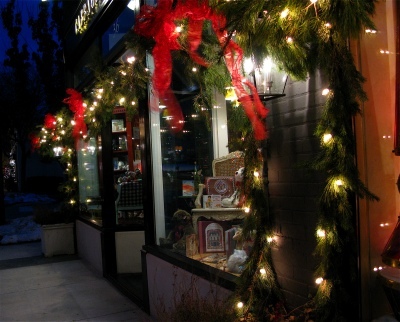 Tracing back to discover their bright origin can be a fascinating study of holiday traditions. Pagans celebrated Saturnalia with outdoor greenery as a sign of hope for the coming spring. It also helped to combat the dull grays and browns of a winter landscape. Since the early Christian church leaders failed to discourage this, they chose December 25th as the day to celebrate Christ’s birth and stamp out the pagan rituals. 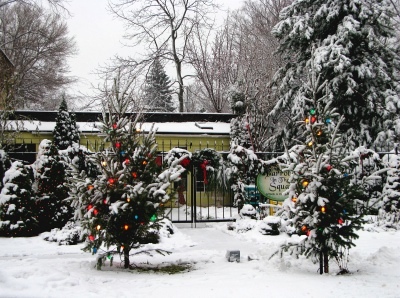 Germans around the sixteenth century first brought evergreen trees inside their houses. After Prince Albert married Queen Victoria, England adopted that tradition in earnest. People melted wax to attach tiny candles to the tree branches. Not the safest idea, since women’s hoop skirts easily caught fire and often resulted in tragedy. Americans soon began to encase the candles in glass balls or tiny lanterns. Naturally, Thomas Edison had to invent the light bulb first in 1879 before the idea of strings of Christmas lights followed—three years later, in fact. Edward Johnson, an executive of New York City’s Edison Illumination Company, was accused of pulling off a ‘publicity stunt’ by stringing red, white and blue bulbs together on a strand. Supposedly a safer alternative to candles, the bulbs’ intense heat proved as dangerous as real flames. People called them ‘twinkle lights’ or ‘fairy lights,’ a term still used in the United Kingdom today. In 1895, however, President Cleveland ordered a lighted tree for the White House. That led the upper classes in New York and Chicago to take notice. They soon hosted “lighting” parties which cost around $300, an expense far beyond the average household budget. By 1903, General Electric started mass production of lights for Christmas trees—but only department stores could afford to buy or rent them. Each strand has eight green porcelain sockets, glass bulbs and a plug. They called the strand a ‘festoon’ but failed to patent the design. Boston’s public areas had the first outdoor illuminated trees in 1912. Some light strands that were manufactured had glass birds, small and large fruits, nuts or Santa Clause figures. Again, only the truly wealthy could afford such fanciful decorations. Five years later, Albert Sadacca eyed the lighted birds in electric cages that his parents sold in their New York City novelty store. 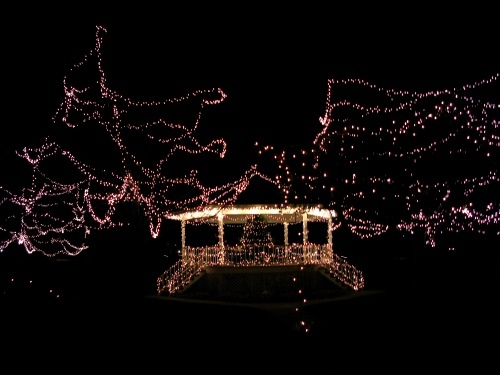 He soon talked them into producing Christmas light strands, with either white or colored bulbs that had been painted. One strand of 24 lights cost $12, however. The average worker usually made 22 cents per hour. Twelve dollars seemed a small fortune for lower class and most middle class budgets in the early 1900’s. Albert Sadacca, along with his brothers Henri and Leon, joined the newly formed National Outfit Manufacturer's Association (NOMA) in 1926. By that time they’d lowered the production cost of Christmas light strands. Technology had also advanced since the Tachon connector was patented in 1924 with its screw-in design and safety cover. The two-prong blade soon followed to interconnect strings for indoor use by 1934. Cords for light strings evolved to all rubber by 1940. During the Depression era, one of the most unusual types of lights were called ‘matchless stars.’ Czechoslovakia produced the solid glass star-shape ornament surrounding the lamps, sold by the Matchless Electric Company. 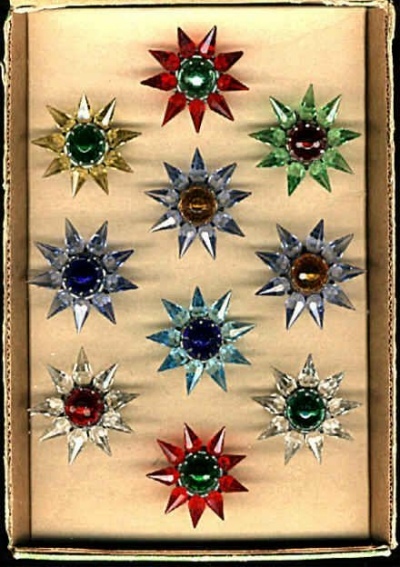 After World War II’s Communist occupation, the glass stars changed to Lucite produced in America. They didn’t prove all that popular, however. People had to settle for keeping their old light sets working during the war years of 1942 through 1945. Rubber, metal and other products all went to the government. Children’s toys had to be made out of wood. But after the war ended, celebrating Christmas in full swing matched the mood of the country and production soon followed. Benjamin Franklin ought to get the credit for ‘bubble lights’ since he first sealed glass tubes with bubbling liquid inside. But Carl Otis patented the design in 1946, and NOMA was the only company to show interest. They bought his patent and hired him to develop the idea further. The tubes held chemicals and glass beads or slugs, which rattled when the liquid heated up. Otis decided to keep a royalty option of $.03 per light—smart man! NOMA sold more than 25 million lights in the first two years of production. Raylite, a competitor for producing lights, sued NOMA and started a patent war. Since Philip Rosenblatt had filed in 1942 for a similar design, Otis and NOMA lost. 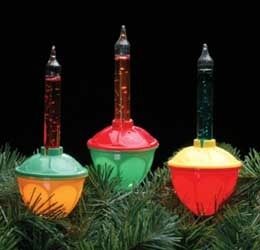 Bubble lights continued to be popular through the 1950’s and are now collectors’ items. General Electric brought out candelabra style bulbs with coiled filaments during the Depression years, although they didn’t become popular until after World War II. They had parallel wires, were smaller for indoor use and generated far less heat than their larger outside lights. One light might go dark, but the rest would remain lit. Although lighting of a huge tree at New York City’s Rockefeller Center first began in 1931, they didn’t use electric lights until 1956. Anaheim’s Disneyland also lit their Christmas tree when they opened the park. The 1950’s and early 1960’s brought the boom of silver aluminum trees. They became so popular that manufacturers soon offered gold, blue and green, even pink, or a combination of colors. Some silver trees had colored tips. Then came the first TV showing of the cartoon ‘A Charlie Brown Christmas,’ aired in December of 1965. The market for aluminum trees dropped like a stone—since good old Charlie Brown bemoaned the ‘crass commercialism’ and tried to find a real tree for the season! Fresh trees returned inside, along with lights. Large lights soon downsized. 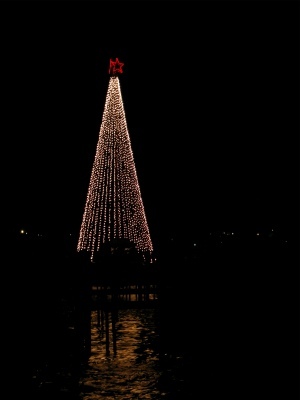 In 1908, Ralph Morris utilized lights from a telephone switchboard and plugged them to a battery to light a Christmas tree. Although he didn’t patent this idea, ‘midget’ style lights began to replace the larger C-7 and C-9 candelabra lights in the late 1960’s and throughout the 1970’s. Flashing or chasing lights soon developed as well. The lights became so cheap and easy to hook up that suburbanites and city folk began swathing houses, roofs and garages. Light sculptures, blow-up figures and neighborhood competitions spawned hilarious movies about blowing out transformers. Fiber optic trees with changing colors also rode a wave of popularity. Even artificial trees can now be bought pre-lit, to the relief of most busy families. Enterprising geeks have hooked their computers to program and accompany their massive Christmas light displays, with flashing lights accompanied by music. Thousands of cars slowly drive by to view them every year. Can’t get out? Google ‘Christmas light displays’ to get your fix! With an emphasis on lowering energy output, LED or ‘light-emitting diode’ Christmas lights are slowly taking over the market. Scientifically, the brightness depends on the wavelength and material used. LED lights can flash with an imbedded microchip. The cost has yet to equal incandescent lights, however. Whatever lights your Christmas spirit, keep it glowing bright!